Reports are coming in that Somerset will keep open all the libraries, including mobile libraries, that it had intended to close before it lost the court case. It is notable that the Council has said that it will not reduce the cuts that need to be made. This is going to be challenging for its library service – £1.35m over four years is a lot – but at least it will be done with due regard to local communities and, let’s not forget, the law. 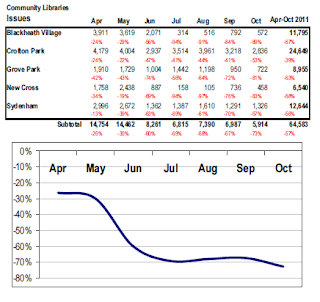 More figures from Lewisham shed more light on the success or otherwise of it’s libraries withdrawn from council control. Even it’s own council report accepts that the move has had “a negative impact on performance”. The figures show that while visitors are recovering after a plummet at the time of changeover, the borrowing of books is bumping along the bottom at around a loss of two-thirds. This despite the council giving one organisation £230,000 for the running of one branch. It looks awfully like that these places (three of whom are now run by Eco Computer Systems, one by Age UK and the last by what appears to be a very brave and motivated bunch of volunteers blackmailed into it) are becoming more community/recycling centres than libraries. There may be other (hardly less worrying) reasons for this – such as insufficiently trained volunteers and one library apparently only currently open in a basement while refurbishment goes on – but, however one plays it, it is hardly a glowing testimonial for the Big Society. Write about your views on public libraries to the Select Committee on Culture Media and Sport. Email cmsev@parliament.uk with “library closures” in subject line. Emails stand more chance of being effective if they give your views on (1) “what constitutes a comprehensive and efficient library service for the 21st Century“, (2) to what extent library closures are compatible with the law and the Charteris Report, (3) the impact closures have on communities and (4) the effectiveness of the secretary of state’s powers of intervention. Deadline: 12th January 2012. NB full details on how to submit your views are here. More guidance on giving written and verbal evidence is here. Hey girl, I like the library too – Tumblr (USA). Pictures of Ryan Gosling saying pro-library chat-up lines inc. “Hey girl, sorry to bother you, but can you tell me classification number for love at first sight?”, “Hey girl, I’ve never had an overdue fine, you know that, don’t you girl?”, “Hey girl, I forgot my library card, if I gave you my phone number, could you look me up?”. Why do people rally to save libraries but not museums – Open Objects. Fascinating piece with lots of answers inc (1) libraries are seen as more under threat, (2) reading is personal and interactive, museums are passive and instructive (3) people regularly visit libraries, (4) higher staff/public interaction, (5) “libraries have takeaway”, (6) libraries are more used than museums, (7) libraries are part of a person’s identity, libraries are “ours”, (8) impact of library closing has far deeper impact on a community than a museum closing, (9) library free gathering places for all. Devon – Opening of replacement St Thomas Library (Exeter) delayed until at least Feb 2012 as original building to be used as shops. Totnes Library to be relocated to larger building. Hertfordshire – Petition to save School Library Service. Redbridge – Libraries part of Vision Trust since May 2011. £16,000 from Council (not Trust) for safety improvements at Wanstead and Woodford Green. Somerset – 11 branches and 4 mobiles are now safe from closure, following court case. £1.35m cut in libraries over four years is still, however, in force. Telford & Wrekin – Dawley library to keep its opening hours due to £3200 p.a. contribution for two years from parish council. Conwy – Council plea for views over future of library service – North Wales Weekly News. “Cllr Geoff Shepherd, town councillor in Llanfairfechan has been behind a 600 name petition to save his local library. Town councillors in the quarry village are confident they have identified a suitable derelict building to move the library into. Ms Jackson said feedback from meetings with councils and community groups would be forwarded to Conwy council cabinet meeting on Tuesday December 13. Representatives from Conwy council agreed to a battle plan over the future of libraries last week. Plans may see libraries in smaller communities moved in to schools or community buildings run by volunteers. They will be open for 15 hours a week and will be given £20,000 towards equipment. Lewisham – Healthier Communities Select Committee – Lewisham Council. 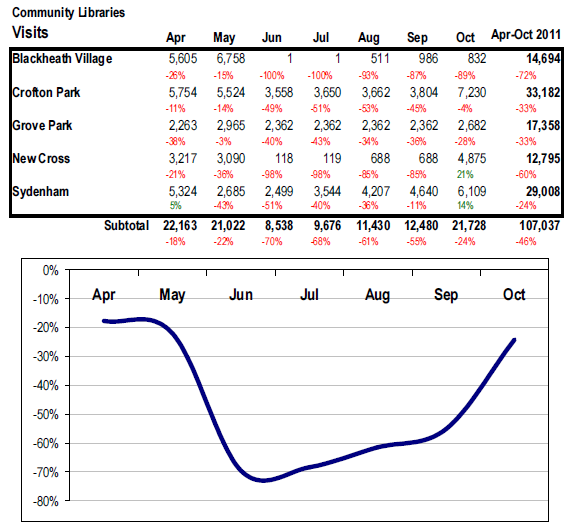 “Overall, Libraries’ performance has been disappointing over the past seven months. This is due in part to the extent, and timing of the changes to the Service. Issues and visits have been adversely affected by the Service-wide staff restructuring which took place simultaneously with the implementation of new technologies and working practises. However, there are signs that performance is beginning to improve and the staff team are fully committed to ensuring that it continues to do so.” … “It should be noted that Blackheath reopened last August in temporary accommodation while their new centre is being developed. 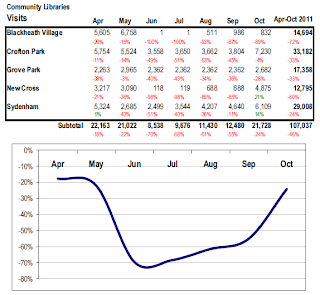 The work is scheduled for completion in October 2012, when full community library provision will resume.” Charts (below) appear to show that while visitors are recovering, issues are being wiped out – is this the problem with computer system, improperly trained volunteers or a fundamental change from a library into something more similar to a community centre? 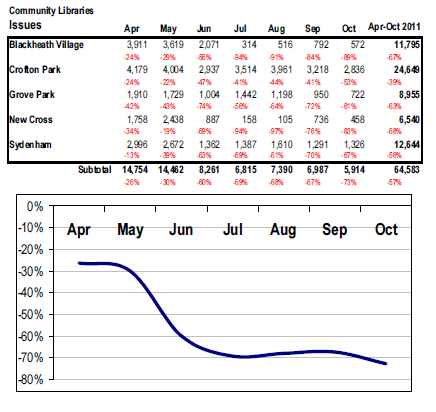 “These community libraries hardly seem like libraries at all” Lewisham campaigner (in email). Telford & Wrekin – Council will pay £3,000 to keep Dawley library hours – Shropshire Star. Dawley Parish Council to pay to keep library at 21 hours per week, rather than proposed cut to 16 hours. Print article This entry was posted by Ian Anstice on December 8, 2011 at 8:33 pm, and is filed under Uncategorized. Follow any responses to this post through RSS 2.0. You can skip to the end and leave a response. Pinging is currently not allowed.